Starting next Sunday, you can visit Bondi's Beach Road Hotel to get your Sunday Cider fix. New Zealand's Rochdale Cider and Gastro Park chef Grant King have teamed up to bring us their 'Beached As' Sunday Sessions which will run every Sunday through the months of December and January. A specially crafted menu will feature three dishes, each of which are available to purchase with a Rochdale cider for $12.50. Crispy cider batter, encasing soft shell crab claws, zingy lemon and lime mayonnaise, wrapped in a crisp lettuce leaf with cucumber and coriander. Cider caramelised apple ice cream, granny smith popping candy. This brightly coloured traditional cider has a light to medium carbonation and a unique cider flavour which you find with more traditional methods of cider making. 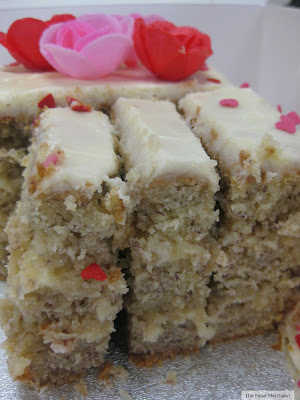 It is not overly sweet and has a nice balanced apple flavour. 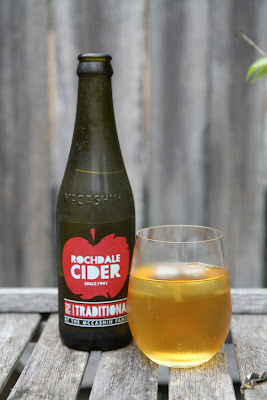 A medium dry cider, it is made using tree ripened NZ grown apples and has no preservatives which is a big plus for me. It is a perfect choice for a hot day as it is rfereshing and crisp. Rochdale is brewed the traditional way by McCashin's in Nelson, New Zealand, whose products are renowned for their use of Palaeo water. You may remember my review of Saxton Apple Cider which also features this famed ingredient. Reported as the purest water in the world, it is said to be sourced from one of the oldest and purest water aquifers known to man - untouched for up to 260 centuries. Rochdale Cider was actually voted Best Cider (NZ) at the 2012 Beer & Brewer Awards in Australia. It terms of food pairing, I don't think you can look past the menu planned by Grant King. Pork, Crab or Caramelised apple ice cream. Yes please! 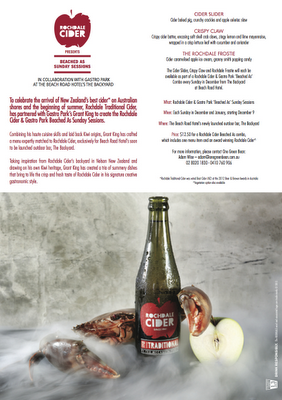 Rochdale Cider & Gastro Park 'Beached As' combos will be available each Sunday at The Beach Road Hotel's newly launched outdoor bar, The Backyard. Rochdale Cider is available at the following hotels in NSW. When: Sunday's from December 9, 2012 through to end of January. New Zealand seems to have a lot of pure waters! I've tried Waivera water and it's good (although I'll admit I love the bottles themselves). You must be the one of the foremost authorities on ciders among Sydney food bloggers. I have not tried Rochdale yet although I have been liking the refreshing Montieth which is also quite deceptive in its alcohol content. I had these last night at #loboplantation and loved it. googling to see if I can it at a bottlo and came here. So clean drinking and nice. this is also a lot better drinking than monteith I got to say.